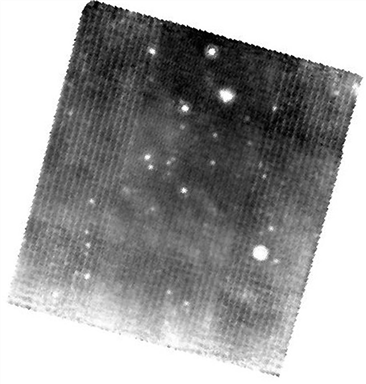 In this recipe, we will use MOPEX to create a mosaic of the MIPS small-field 24 microns photometry observation of the Pleiades star HII 173. An APEX source extraction recipe follows that uses the same dataset. Use the Spitzer archive to download the BCD and post-BCD for AOR 5315584. Recipe 1 has instructions for using the Spitzer archive. We will just be using the 24 microns data. MOPEX (http://irsa.ipac.caltech.edu/data/SPITZER/docs/dataanalysistools/tools/mopex/) should be installed as well. 1. The online (=automatically produced) 24 microns mosaics are very good, often good enough to start analyzing right away, depending on your science. For an initial look at your data, use ds9 or your favorite image viewer to examine the on-line mosaics that came with your data. Note that there are two mosaics in this directory. The first is the one where the 24 microns array is "prime", and the other is where it is not, e.g., the ancillary data. Those non-prime data are not what we are interested in here. There are lots of sources here! 2. Set up things to run, part 1. Personally, I like to have just one copy of the cal/ directory into which I can put the latest pmasks and the PRF I want to start from (check the SSC web site for the latest versions of these files: http://irsa.ipac.caltech.edu/data/SPITZER/docs/mips/calibrationfiles/). Also copy the cdf namelist files for this example into a cdf/ subdirectory. 3. Set up things to run, part 2. The *.txt files are needed as input to the mosaic.pl script. These lists will contain all of the bcds, masks, and uncertainty files. ������ To figure out which files are serendipitous data, the easiest way to do this is to look in the header for the keyword PRIMEARR. You can examine each header separately, but this is how I do it in a more automated fashion. I use the tool "imhead" (available from the unix command line), which is part of the WCS tools package (http://tdc-www.harvard.edu/software/wcstools/index.html). Type "which imhead" at the unix command line to see if you have that package installed (if it says "command not found," you don't have it) and go install it if necessary. Finally, edit the namelist to reflect where your cal files are located -- be sure to use the right pathnames! "mosaic.pl: Command not found." means you have not sourced the csh when setting up the mopex package in your current shell (window). other "files not found" -- make sure you set all the paths correctly in the namelist, and that you're sitting in the correct directory when you call mosaic.pl. Check the mosaic for anything that looks 'odd.' It should look pretty much like the online mosaic (which came with your data, in the pbcd directory). See figure below and FITS file http://irsa.ipac.caltech.edu/data/SPITZER/docs/dataanalysistools/cookbook/files/my24mosaic.fits. If you didn't remove all of the ancillary data, you'll wind up with what looks like two separate mosaic pieces in the same FITS file. Go back and be sure you removed all the ancillary data. If you didn't remove the first frames, you'll get sharp gradients across the frame; see the MIPS Instrument Handbook. A slow gradient across is fine, and may even be real zodiacal light variations.